We have such beautiful kale this year and such alot of it! I'm trying to incorporate it into as many dishes as possible. (Fortunately, we both love it!). Last night we had our friend Brenda over for dinner and I made a kale lasagne, using up 1 1/2 lbs of fresh kale, and some tofu ricotta and homemade spaghetti sauce that I had in the refrigerator. It was delicious and definitely a keeper! I served it with some lovely roasted beets from my friend Holly, just sprinkled with balsamic vinegar, olive oil and fresh parsley. We ended the meal with some tea and organic green grapes-- very satisfying! Cook the lasagne noodles according to the package directions—don’t overcook! Rinse and drain them and lay them out flat on a baking sheet. Place the sliced kale in a large pot. Boil about 1 quart of water (in an electric kettle, if you have one—it saves energy) and pour it slowly over the kale, mixing with a long spoon until it is all submerged. Cover and let it sit for about 10 minutes while you slice the onions, etc. After 10 minutes, drain the kale in a colander, rinse briefly with cold water (until cool enough to handle), and then squeeze as much water as possible out of the kale. Fluff it out a bit with your fingers after squeezing it. Heat the oils in a large heavy skillet over medium-high heat and add the sliced onions and sausage crumbles. Sauté them, stirring frequently, until the onion has softened and the sausage browned a bit. Add the garlic and red chile flakes (if using) and sauté briefly. Add the kale to the pan and sauté again briefly. Season the mixture to taste with salt and freshly-ground pepper. Preheat the oven to 400°F, if you are going to bake immediately after assembling the lasagne. Oil a 9 x 13” baking pan or dish. Lay 4 of the lasagne noodles to cover the bottom of the pan. Spread the noodles evenly with 1 cup of the spaghetti sauce. Add half of the sausage/kale mixture and spread evenly. Cover that with half of the ricotta, spreading evenly. Sprinkle evenly with 1/3 of the soy parmesan. Lay 4 more of the lasagne noodles over the casserole. Repeat the layering as before. Cover with the remaining 4 lasagna noodles. Spread evenly with the remaining 1 cup of spaghetti sauce and sprinkle with the last of the soy parmesan. Cover the pan loosely with foil or baking parchment. Bake at 400°F for 40 minutes. Remove the foil or baking parchment and let sit for about 10 minutes before cutting. This is a different take on the Charred Corn, Black Bean & Toasted Barley Salad from an excellent book in my cookbook collection called “Spilling the Beans” by Julie Van Rosendaal and Sue Duncan. My husband doesn't like barley in salads and I had no mangoes or red onion, so this is my riff on this colorful full-meal salad. It is filling, colorful and delicious! I made this for lunch last week when we had guests and it was very well-received. 3. In a small bowl or jar, combine all the dressing ingredients and whisk well to combine. 4. Add the cooled corn, beans, peppers, tomato, peaches or nectarines, green onion and parsley. Add the dressing and toss well. 5. Serve immediately or refrigerate for up to a few hours before serving. 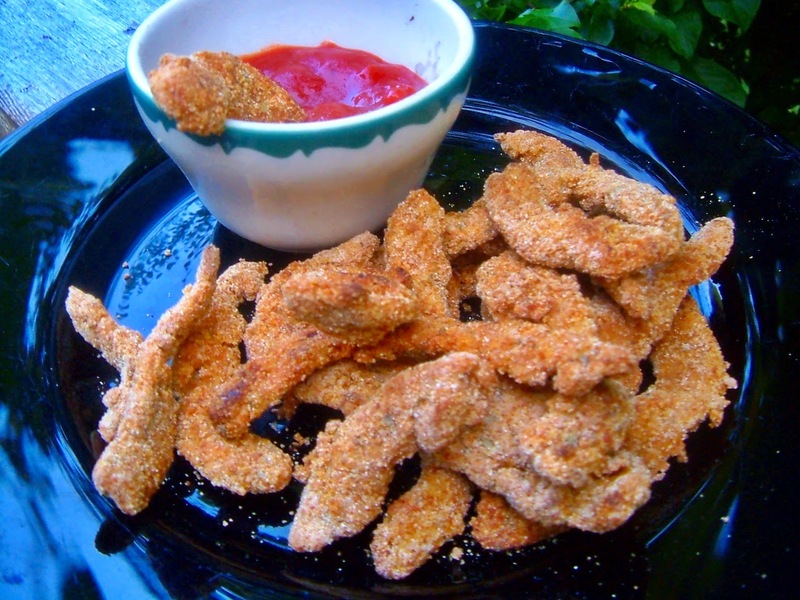 FOR KIDS OF ALL AGES-- CRISPY SOY CURL OVEN-"FRIES"
I'm sorry I haven't blogged for so long! This is company time on the island, so we've been super-busy entertaining. I haven't had time to devise anything new lately-- I've been cooking up tried and true recipes for my guests! So, I'm posting an old favorite family recipe this week. This was a spur of the moment recipe that I devised several years ago. I wanted to do something different with Butler Soy Curls® (see this post for info), but any "chicken-style" seitan cut into strips or commercial vegan “chicken” strips will work, too. Kids of all ages love them! Serve them with any favorite dip,barbecue sauce, or chile sauce (I mixed half ketchup and half tomato salsa), and enjoy! vegan broth OR use 4 cups “chickeny" seitan cut into "fingers"
Mix together the Coating mixture ingredients well in another flat baking dish. sprayed with oil from a pump sprayer bottle. crispy. Serve hot with your favorite dip or sauce.